In January 2019, Managed by Q, a workplace management platform, released their 2019 Workplace Trends Report, which focuses on the belief that a human-centered office is the new trend on the rise in the corporate world. According to their research and their experience working with companies across the U.S., the growth of responsive, interactive technology and the ascension of the “millennial” generation into the workforce and subsequently into leadership roles, has created a corporate landscape where employees are demanding more from their employers than ever before. Millennials have been cited for creating a more interactive approach to work and their personal lives, coining the term “work-life balance” to explain the integration of the two. This new approach has caused millennials (as well as employees of every generation) to place a high value on community and purpose-driven work, which they’re actively seeking from the companies that they work for. Due to this shift in motivation within the workplace, in their report Managed by Q identified five trends that they believe companies must adopt “to effectively attract and retain top talent”. They are: the technological evolution of human-centered workplace design; the rise of co-working and the focus on workplace hospitality; flexible workplace policies; culture is essential for employee recruitment and retention; and diversity and inclusion are fundamental business practices. However, we believe that most important of these trends is the cultivation of office culture, which is where Managed by Q specifically referenced our company. Because at FoodtoEat, our concierge catering service helps to improve office culture in three specific ways. 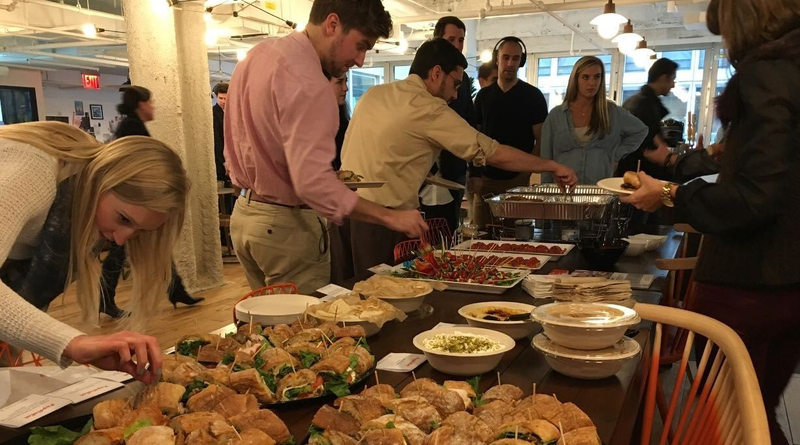 Managed by Q’s research shows that today “individuals seek to cultivate a greater connection to one another”, which is why we advocate for team meals in every office. Whether it’s breakfast, lunch or dinner, team meals help to foster a sense of community within the office. They bring together individuals from every department and allow them to discuss common interests, examine operations for areas of improvement and interact with and learn from individuals with differing opinions and beliefs. This exchange of ideas improves team work and invites creative solutions to issues that the company may be facing. Rather than being a “perk” that looms overhead, hinting that it could be taken away at any moment, building team meals into the fabric of office life encourages a collaborative environment where co-workers rely on one another for help and reinforces the idea that perfection isn’t realistic. Mistakes help employees learn and grow and allow them to think outside the box when problem-solving or finding ways to prevent future mistakes. Being that employees are the most valuable asset in a company, corporate catering is also a way to recognize and reward them. Celebrating holidays, birthdays and personal and professional milestones is a way for companies to show that they understand an individual’s value and are appreciative of it. Showing appreciation for someone’s work or personal achievement is a simple yet effective way to demonstrate that, as an employer, you are invested in their happiness and honor these moments as well. Whether it’s ordering their favorite dessert or sitting down for lunch together, creating that time during the day to make an employee feel seen and respected is key to showing your commitment to them as a part of your team. That recognition increases productivity because it incentivizes employees to continue to invest their time, energy and passion into the work that they do. As Managed by Q found, “employees want to feel like work gives them a personal purpose” and purpose can only continue to be a motivating factor when it is identified and applauded. More than the connection created through team meals or the recognition of individuals in the workplace, our mission to work with immigrant, women and minority-run food businesses throughout NYC is what sets us apart from other catering services. Employees in the corporate environment want “an opportunity to be part of something larger than themselves” and by working with our service, they’re able to directly impact their local food community. Employees are looking for companies that not only appreciate them but also have a set of values as a company that guide their decision-making and positively impact the larger public. Because of the union of work and life that employees have become accustomed to, they want to be a part of a company that connects with their personal ethics and lifestyle choices. More and more, employers are being asked about how they’re creating a cycle of social good in their communities and being held to a higher standard by their employees. Working with our company, not only does an employer reward their own employees, they also send a clear message on what they value as a brand, which attracts individuals that agree with that message and creates a strong culture of like-minded people working towards a common purpose.